Well I think these qualify as LO's, it's the new system with all the pockets. I'm not converted for general scrapping but for speed and getting lots of pics scrapped it's good. Probably even quicker if you use the papers they sell for the purpose too. Bad points, trying to fit the pics that go together in the shaped slots for the page, if you're marvelous you could plan to have them printed the right orientation and size, er, I'm not that organised. Also photographing them is not great as you will see and my scanner is A4 so that's a no go. But I've got these done in a couple of evenings and an afternoon, so that's good. 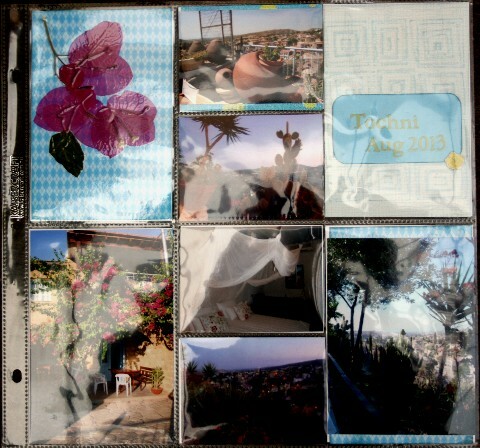 Probably back to the photobook next year though, more stressful than this but cheaper and possibly more user friendly. It's a pity this one of walking on/in Troodos doesn't show clearly as I like this one, I used some of the bark shown in the pics. Well that's the quickest I think I've scrapped 151 photo's! Ah, now is this the 'project life' stuff my friend Chrissie was telling me about the other day, or a different system? I could be tempted to have a go alongside traditional scrapping, simply as a means to get more pics scrapped. That said, it seemed like quite a bit of money to shell out for the pockets and albums? Jeez, you've got a lot of pics done. These are great for that, way too many for normal scrapbooking. I like them Karelyn. I'm debating whether to get some for a couple of layouts, but not sure. I'd be punching my own holes though, not buying an album. 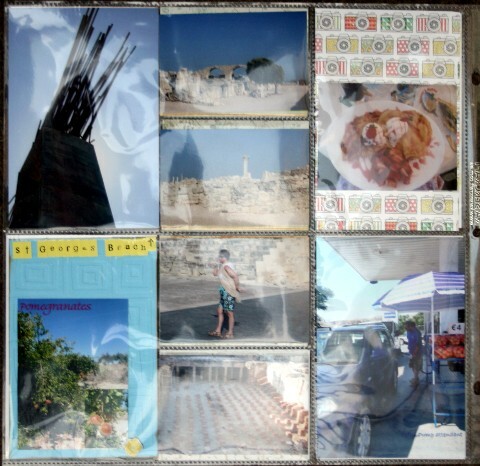 i bought some at last crop and took some away last weekend , i know just what you mean about the photo organisation and think its a lot of faff but it is a great way of putting lots of pics on one page ,i like it and i dont , i think its cheating at scrapbooking though. yes tina it is the project life stuff . im going to mix it in with my albums .not sure if the pages are the correct size as all my sleeves i allready have but i dont care . 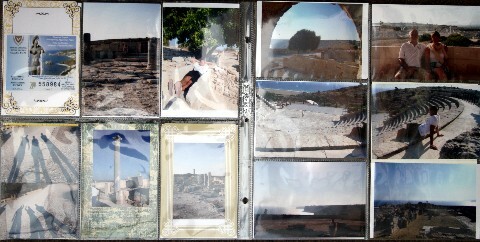 looks as if you saw many places but cant really see a lot of the photos themselves . Looks like a good way to store a lot of pictures, much nicer than storing them in a box. 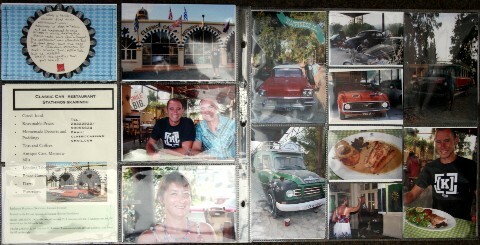 I've got those - they're called photograph albums, lol! These are the Kaiserkraft pages, (£7.99 for 10, buy 3 get one free). I also have a set of photo freedom ones which have the papers with them, to do my Hadrian's wall pics with, I got it at the retreat. Same sort of thing as PL. I was pleased to have used a lot of the tickets and tat that I always bring back from hols and mostly don't use. They do fit standard ring bound albums, and I expect post bound too. I didn't buy a special album. Lorraine, I've often thought about stitching 'regular' pockets to make my own apertures to suit the size, and I might actually try that now. 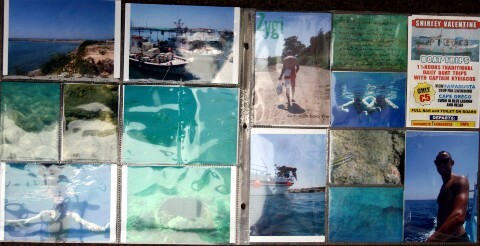 I did slit through some of the pockets to fit brochures or larger pics in as I wanted them on that particular page. I think you're right Ruth, it is cheating, (and doesn't look as nice at all) but not as much as a photobook, which would have been my other alternative. It wasn't a chore though, which it would have been if I'd scrapped, well, I never would have scrapped, that many pics. Some of my better pics are on the thread Kim, but I had so many I didn't put any from the other camera on there. Yes I have several friends that do this style all the time now, since theyve had babies and just cant keep up with it all. Both friends are cross that you cant claim any points for it on UKS (where they think its cheating) and it is hard to photograph them, I cant see many of yours as well as Id like Karelyn. HOWEVER, its a lot better than them languishing in a box or on the computer for months/years because theres too many of them and you cant face the huge task. After all, how many of us have the space (never mind the time and money) to make almost a whole album from every holiday or event we have? Personally I have about 20 stoupa photos printed, and that was scaled down from about 80, but I can reasonably only get 2 or so on a page and I dont want 10 layouts of the same thing... I can see why this has caught on. I think it serves a purpose here, and you can always take 1 or 2 of the special photos and do a conventional page with those and put them in the same book. That's what Chrissie said; do one or two traditional LO's then these can sit alongside. Sounds like the only way I will ever get a reasonable number of pics in albums to be honest; I have been scrapping for years but just get further and further behind. Will investigate the Kaisercraft set, might well be a bit cheaper than Becky Higgins. I have used these types of pages in my New York album that I still need to finish, I'll probably use it for my kitchen layout pages so I can have one before 12x12 and one after 12x12 and the pics in between rather than trying to squish things on one page. Yes you can add hidden photos to a page but that makes them thicker which then disrupts other pages. Mind you my NY photos were all printed 4x6 so I haven't had to mess with anything, it's the first time I used original pics but I have copies on the computer. Interestingly, found some Kaisercraft pages, and compared them with the Project Life ones; if you're prepared to buy £30 worth of mixed page protectors, the PL ones are about half the price of the Kaisercraft ones. Not that I currently have £30 spare, but at least I have a potential item for my c*****as wishlist. Lol, I was thinking the same as Lynda. Look super anyway, maybe I will need some after this w/e.